I was staying over the weekend in this old log cabin in Northern Minnesota and sleeping in the loft. Just prior to dawn on Saturday morning I heard a couple of bats flutter in to a roosting spot they have just outside the loft window. Going to bed Saturday night I put my nose right up to the screen to see if I could see the bats. No bats. But I did see a speck of bat dung just outside the window. Then I saw a speck of bat dung on the screen on the INSIDE. It took my groggy head a second to conclude that "DUNG INSIDE" also means "BAT INSIDE", and at the very moment this realization sank in, a bat flew at the back of my head and darted away as I turned around. I pulled off the screen so the bat could fly out the window and I pulled off another screen on an opposite wall as well. The bat flew figure-eights between these windows as I tried to block its path using the removed screen as a deflector and coerce it to exit. After seven of these fly-bys, the bat disappeared down a gap between two notched logs. 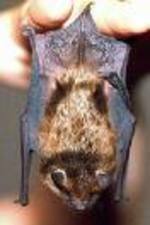 I'm all for bats because they eat mosquitos. I'm just not interested in bats flying around in the cabin. So I climbed down out of the loft to find some aluminum foil to stuff in the bat hole. My uncle stuffs mouse holes with steel wool with the reasonable theory that mice don't like chewing steel wool. Lacking a ready supply of this, I thought of aluminum foil. Unfortunately, the roll was basically empty. So I went over to a basket by the woodstove that is filled with old newspapers used for lighting the fire. I grabbed a bunch, climbed back up into the loft and into the tight triangle of space where the roof, wall, and loft floor meet and the bat has its little entrance/exit hole. I shoved in the foil and then wad after wad of newspaper until I couldn't jam any more in (I double-checked in the morning to make sure there was a hole leading outside so the bat would not starve in the wall, but could continue its nightly mosquito feast). A last piece of newspaper I began to crumple had an article titled "Let's play." This caught my eye, as did the author: Richard Tait, founder of the Cranium game and toy company. So now it's past midnight and I'm wedged in under the roof reading a year-old copy of Parade magazine. In the fourth paragraph, Tait mentions The Genesis of Animal Play: Testing the Limits. This book title reminds me of a presentation I saw just a couple of weeks ago by Dr. Stuart Brown at the PUSH conference in Minneapolis. Dr. Brown is the head of the National Institute for Play and in his talk he showed slides from Alaska of a hungry polar bear approaching a chained sled dog. You'd think the dog was lunchmeat, but the bear and dog, rather than fighting, engage in 15 minutes of, um, "horseplay." So I find myself wedged under the ceiling next to the newly plugged bat hole, having originally thought I was the human controlling the animal, and now wondering, given this example of interspecies play between bear and dog, if I hadn't just been engaged in play by a bat! Was this bat "testing the limits"? Was I "testing the limits"? Probably neither of these, but I need to buy Dr. Burghardt's book to see what he means by this phrase. Whatever the case, it certainly was odd to have this bat experience provide direction for further research into play in animals (and humans).